Posted on Thursday, May 31st, 2007 at 6:04 am. If we flashed back four years ago and we told the pre-college, pre-med me that I would end up writing a senior thesis about Taiwanese American film, I would have been pretty surprised. But I probably would’ve been glad too. Little did I know I would ditch the sciences to design my own major in Asian American studies and documentary studies, but in many ways, it’s all been a long time coming. I definitely remember checking the Center for Asian American Media (formerly NAATA)’s website periodically, wondering when they would ever add “Taiwanese” as a category under ethnicities. Lo and behold, thanks to filmmaker Anita Chang, the link finally appeared a couple months ago. And in recent years we’ve also seen Taiwanese Americans poking at the mainstream with Justin Lin’s Better Luck Tomorrow (bet you didn’t know he was Taiwanese American), which was dubbed the first big commercial Asian American film, as well as Ang Lee’s Oscar-winning success with Brokeback Mountain. Beyond that, a number of strong independent Taiwanese American filmmakers are now emerging on the scene. They might not have thought of themselves as part of a Taiwanese American canon, and they’ve probably never been grouped together until now, but these filmmakers all produce works that reflect, in varying ways, what it is to be Taiwanese American. From films set in and about Taiwan to films more broadly about social justice and race; from 6-minute shorts to full-length features; and from fiction narratives to experimental documentaries, this is a collection of inspiring, beautiful, and thought-provoking works. With all that said, it’s my pleasure to introduce to you these six Taiwanese American filmmakers and a sample of their films. Five thousand years of Chinese culture. Fifty years of Japanese occupation. Forty years of martial law. Ten years of democratization. What does it all add up to? What is Taiwan–an independent nation or an upstart, renegade province of China? Who gets to decide? Han Chee is a personal, experimental documentary about Taiwanese history and identity. Divided into three parts, it is a poetic meditation on colonialism, culture, memory, identity, and nationhood. Given Taiwan’s tumultuous past (colonized by Japan 1895-1945, occupied by the Republic of China since World War II), and its currently ambiguous status in the international arena, what does it mean to be Taiwanese? Where is the intersection between official history and personal experience? Jean Cheng is a second generation Taiwanese American, born in Boston, Massachusetts, and raised in Portland, Oregon. Her award-winning first film, “Across a Paper Ocean” (1993), was screened at festivals across the United States and broadcast on public television. “Han Chee (Sweet Potato)” was her M.F.A. thesis film. For the past 7 years Cheng has been working with California Newsreel, a non-profit organization that distributes and produces films on race, diversity and social justice. With California Newsreel, Cheng has worked on projects such as “RACE – The Power of an Illusion” and “What’s Race Got to Do with It?” At the moment, she is working on an extensive companion Web site for Newsreel’s PBS series on race- and class-based health disparities, called “Unnatural Causes.” The series and Web site will be launched in Winter 2008. Even with all this, Cheng has not lost her ties to the Taiwanese American community. She recently became involved in NATWA II and one of these days plans to produce a documentary on the first generation of Taiwanese Americans in partnership with Karen Liao who was developing a dissertation on the topic. From infancy, an Asian American woman learns the game of perfection. But if your goal is perfection, will the game ever end? Milton Bradley’s game Perfection is “a race against time” where players must match shapes to a board in 60 seconds. The game mirrors an Asian American woman’s struggle to achieve success and gain her parent’s approval. Taught the game as an infant, she races into her teens winning competitions and getting straight A’s, only left to wonder whether or not her parents will love her even if she fails. Ultimately she must decide whether to end the game. Also check out Karen Lin’s spoken word video “BYSTANDING: The Beginning of an American Lifetime.” It’s a collaboration with Taiwanese/Chinese American spoken word artist Kelly Zen-Yie Tsai. This weekend the film had its NY premiere at the Media that Matters Film Festival and it won the War and Peace Award sponsored by Netflix. The festival, which is dedicated to films with a social conscience, will be traveling the film around the country to share with communities, activist groups and educators. * early July it will screen at the ACV Asian American Film festival in NY. After receiving a Sociology/Public Policy degree from Pomona College and a Masters Degree in Public Policy from UC Berkeley, Karen decided to head to Hollywood and follow her passion for film. She started as an agent’s assistant, and moved on to feature film production, working in various positions including: assistant to actor Nicolas Cage (Face/Off, City of Angels), and assistant to director Roger Donaldson (Thirteen Days). In 2000, she made the leap into production managing music videos and producing short films. In March 2001, she founded ZuZu Films which has produced several projects for KSCI (Channel 18) and other national Taiwanese American organizations. She is currently developing a documentary and a romantic comedy feature film, A Lucky Accident. Karen’s personal goal is to bring more Asian American faces to the silver screen. Amidst the political upheavals of a nation and the world, the filmmaker navigates cultural, geographical and linguistic distances in search of wisdom and hope from her 100 year-old Taiwanese activist grandmother (Ama). Anita Wen-Shin Chang is an independent filmmaker. She was born to parents who immigrated to the U.S. from Taiwan in the 1960’s, fleeing a dictatorship. She grew up in Akron, Ohio and Massachusetts. Chang received her BA in American Studies and English at Tufts University, and MFA in Cinema at San Francisco State University. She is currently teaching in the Department of Language and Communication of Indigenous Peoples at National Dong Hwa University, Taiwan, and she is producing a digital film on Leprosy patients in Taiwan. from anitachangworks.com; order a copy and check out her many other works. 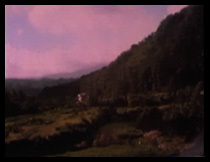 A Tiger’s Tale is Yang’s film about her grandfather, created in response to his passing in 2004. Yang describes him as the one “who taught me how to find myself, to understand, finally, as a person of Asian descent, who I really and truly was. He taught me what it meant to be Taiwanese—even though I was also ½ white and born and raised in the states. The piece also is a metaphor about the struggle that Taiwan has undergone for years in it’s quest for independence from China. Yang’s grandfather was a prominent activist on this issue and it is in this work that the two saw eye to eye. Also see Yang’s more recent film, Both/And (2006, 6:32 minutes); it explores questions of identity between father and daughter in an immigrant Taiwanese family. The story revolves around how the daughter (Yang) and her father both have two names (a Chinese and an English name) and how it is through these names that they connect with the heritage of a country of origin (Taiwan) and with the country in which they call home (United States). This film was made in response to the rise of immigrant rights in the public discourse in 2006, wanting to explore the story of one of many Taiwanese who came to the United States to achieve a graduate degree, and then chose to stay and raise a family instead of returning to Taiwan. The film discusses the impact of immigration by chance, at the personal and family levels. A writer, collage artist, and a dreamer, Stephanie Yang is a mixed-race Taiwanese and European American artist living in the Bay Area. She began making films in 2002 after studying film theory in grad school. She manipulates words, images, and stories to encourage dialogue about human rights and social justice issues. Yang founded shiftingnarratives.com, a community of filmmakers who use the short narrative form to give voice to those who are marginalized and to transform traditional assumptions. Arvin grew up in Northern California and studied architecture and visual design at the University of California, Berkeley. After working in multimedia in San Francisco, he moved overseas to apprentice with Taiwanese filmmaker Edward Yang, working as an assistant producer for several years. This project is still in the works, but be on the lookout– it’s coming soon. A boy, believing his ill mother is the Moon Lady, resolves to bring her back to earth—but learns that what she really needs is love. Wendy Seo-Ling Cheng recently completed her Masters in Filmmaking at Tisch School of the Arts, where she was the recipient of two scholarships. Her first stint at dramatic writing was a sitcom-ish play she wrote and produced with a grant from Cornell University’s Asian American Playhouse, while studying literature. In between schools, Wendy has worked as an English teacher, a book inventory manager, a freelance journalist, and a singer. She hopes that her student loan debt will force her to abandon waywardness and begin her real work. Anna Wu is a very recent Duke University graduate. She graduated with distinction, completing a written thesis on Taiwanese/American Film about Jean Cheng’s Han Chee and Anita Chang’s 62 Years and 6500 Miles Between, as well as producing her own 25-minute personal documentary titled Daiwan-Lang: Taiwanese American Identity?